Purchased by the previous owners in October 1950. Anonymous sale; Christie's, London, 30 May 1997, lot 27. 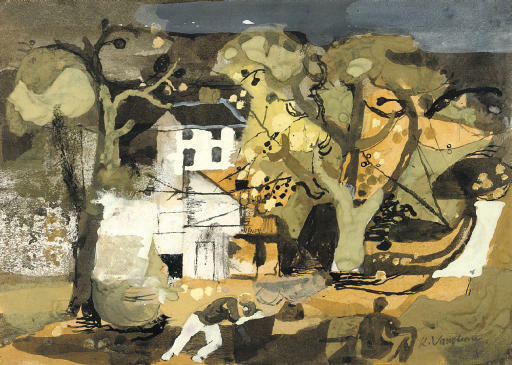 Keith Vaughan painted several pictures of white houses in the 1940s, which are often surrounded by trees. These scenes were inspired by his visits to Malton in North Yorkshire. Malcolm Yorke writes 'The vast skies, fells and moors of his Yorkshire surroundings did not appeal to Vaughan. Like Sutherland, and [Samuel] Palmer too, he needed to create enclosed spaces; houses shielded by trees, figures in front of landscapes' (The Spirit of Place: Nine Neo-Romantic artists and their times, London, 1988, p. 267).